252 pages | 23 B/W Illus. As Enlightenment notions of predictability, progress and the sense that humans could control and shape their environments informed European thought, catastrophes shook many towns to the core, challenging the new world view with dramatic impact.This book concentrates on a period marked by passage from a society of scarcity to one of expenditure and accumulation, from ranks and orders to greater social mobility, from traditional village life to new bourgeois and even individualistic urbanism. The volume employs a broad definition of catastrophe, as it examines how urban communities conceived, adapted to, and were transformed by catastrophes, both natural and human-made. Competing views of gender figure in the telling and retelling of these analyses: women as scapegoats, as vulnerable, as victims, even as cannibals or conversely as defenders, organizers of assistance, inspirers of men; and men in varied guises as protectors, governors and police, heroes, leaders, negotiators and honorable men. Gender is also deployed linguistically to feminize activities or even countries. Inevitably, however, these tragedies are mediated by myth and memory. They are not neutral events whose retelling is a simple narrative. 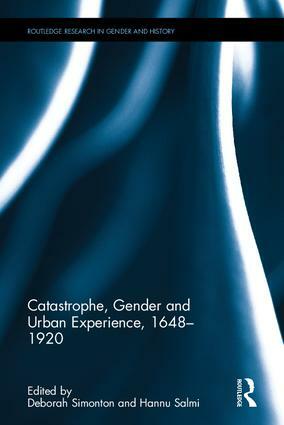 Through a varied array of urban catastrophes, this book is a nuanced account that physically and metaphorically maps men and women into the urban landscape and the worlds of catastrophe. Deborah Simonton is Associate Professor of British History at the University of Southern Denmark. Hannu Salmi is Professor of Cultural History at the University of Turku.